Now we should not think that the Baptist is being difficult or, on the other hand, being merely polite. Rather, his display of reverence fits the occasion and in turn brings about the revelation of Our Lord's humility and His gift of baptism. John's holy reluctance to baptize Our Lord comes not from an uncertainty about his mission but from the knowledge of his unworthiness. It is the proper reaction to Our Lord's presence. We find this same response in other Gospel figures. When Our Lord announces that He will come to his house, the centurion in Capernaum cries out, "Lord, I am not worthy to have you come under my roof" (Mt 8:8). When St. Peter perceives Our Lord's divinity, he falls on his knees and says, "Depart from me, for I am a sinful man, O Lord" (Lk 5.8). And again, when Our Lord goes to wash his feet at the Last Supper, St. Peter draws back saying, "You will never wash my feet" (Jn 13:8). 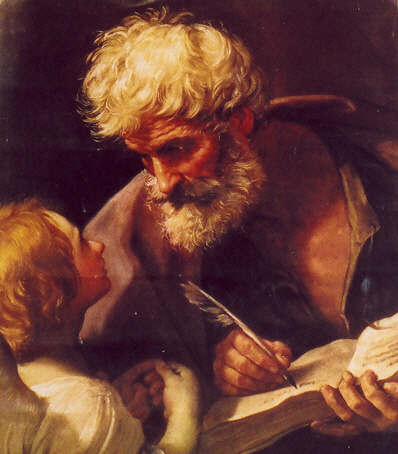 Even John the Evangelist - the disciple whom Jesus loved - displays this reverence. falling on his face "as one dead" before our Lord (cf. Rv 1:17). But there is more than just an acknowledgement of personal unworthiness at work here. St. John's reaction emphasizes Christ's greatness specifically at His baptism. He draws back from this baptism ultimately because he knows that Our Lord is the only one who can confer power upon the ritual. "I need to be baptized by you, and yet you are coming to me?" He himself had told the crowds that the Christ would baptize "with the holy Spirit and fire" (Mt 3:11). He realizes the absurdity of baptizing the one who alone can make baptism effective. And this absurdity only highlights how Our Lord redeems us: not through the various worldly powers the devil would offer Him in the desert, but through His humble assumption of our guilt. Thus John's humility anticipates a greater act of humility - the holy one of God was about to submit to a baptism of repentance. In the end, John's reticence must give way to God's humility. Our Lord tells him, "Allow it now, for thus it is fitting for us to fulfill all righteousness" (Mt 3:15). The time had come for John's holy fear to yield to Our Lord's plan of redemption. The phrase "allow it now" might be misleading. It does not mean that John and Our Lord were play-acting. "Allow it now" does not mean "Let's pretend." Rather, it indicates that the fullness of time had arrived and, man's attempts to justify himself proven futile, God had come as man to take the task upon Himself. Accordingly, "to fulfill all righteousness" means that Christ takes upon Himself all our sins to set us right with God. By submitting to the baptism of John - a baptism of repentance, remember (cf. Mt 3:11) - Our Lord assumes the place of sinners. By being buried beneath the water, entering what Pope Benedict has called a "liquid tomb," our Lord identifies Himself with those loaded down - buried, entombed - by sin. The fulfillment of all righteousness begins in the Jordan when He unites Himself with sinners. It is consummated on the Cross when He who knew no sin is made sin for us (cf. 2 Cor 4:21). The exchange we witness at the Jordan between the Baptist and the Christ establishes a pattern for the living out of our baptism - that is, for the Christian life. It is a pattern of mutual humility between God and man. Like John, out reaction to the Lord's presence should be one of reverence and holy fear. We have to set aside our casual irreverence, that insensitivity to sacred things so characteristic of our culture. We must humble ourselves before Him. At the same time, we must recognize and accept that greater humility that alone raises ours to glory. He humbles Himself - receiving a baptism of repentance, assuming the full penalty of sin, to fulfill all righteousness - "so that we might become the righteousness of God in him" (cf 2 Cor 5:21).